The illustrious NGO, the ‘Centre for Public Interest Litigation’ which enjoys enormous the credibility in Indian Courts, had to face some unconventional questions from Chief Justice of India regarding the source of information and scrutiny of it before filing the PILs. The CJI, heading a bench which was hearing a fresh PIL filed by CPIL challenging the grant of 4G spectrum licenses to Mukesh Ambani's Reliance Jio Info comm Ltd, noted that 50 PILs have been filed by the CPIL over the years, but it was of the impression that the NGO “did not have any credible mechanism to verify the information which formed the basis for filing the PILs”. The bench, also comprising Justices A K Sikri and R Banumathi, observed that there should be a credible mechanism to scrutinise the information before filing PILs. The Court was apprehending that vested interest people, to settle scores in their business rivalry, might misuse the credibility enjoyed by the CPIL. “When we entertain your petition, you must establish a credible mechanism of scrutiny. People of eminence should apply mind and certify that such a mechanism inspires confidence. We want to make sure that a petition filed by CPIL has gone through a particular process and is genuine”, the bench said. 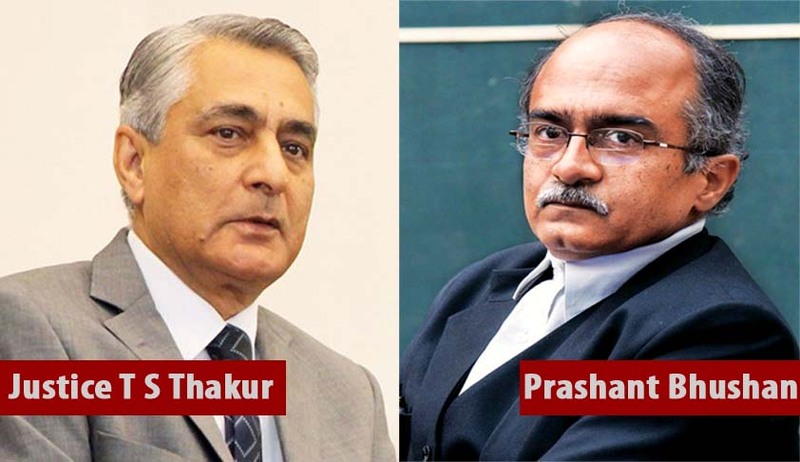 Bhushan replied in negative and said that there is an executive committee of Senior Advocates like Anil Divan, Shanti Bhushan, Colin Gonsalves and others who decide on the filing of PILs. The bench said it was of the view that if there was a genuine mechanism to scrutinise information, there would be no problem. When Bhushan said that CPIL has a research wing to look into the information and materials, the bench said there should be an investigating wing that can give a report so that credible attempt can be made. Bhushan made an attempt to make it clear that it was aware of all the questions that was arising in the minds of the bench and said, we do not have any personal interest. He also said the PIL against the company was filed on the basis of the draft CAG report which had spoken about certain irregularities in the grant of 4G licence. Bhushan informed the Court that there have been cases where even whistleblowers themselves do not want to come forward and prefer NGOs to take up their cause as happened in the leaked e-mail case of Essar pointing towards the corporate-political-bureaucrat nexus. Centre Public Interest Litigation, has to its credit the Public Interest Litigations which even changed the course of Indian Politics. In most of the cases, the PILs filed by CPIL ended up as vehicle for the Courts in its pro -active approach in the filed of transparency in governance, institutional integrity, sustainable development, environmental pollution etc .